From the story in which Peter encountered the risen story I will look at ‘power to forgive’. Forgiveness as culture in God’s kingdom, as a necessity and release, restoration and reconciliation as result of forgiveness. 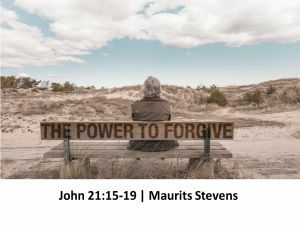 The teaching of Jesus on forgiveness is radical and it’s certainly not easy to put into practice. It takes courage and humility. And yet it’s one of the most powerful steps we can take! As we celebrate St Valentine's Day, we will look at the story of Apostle Paul in Acts 9 after his encounter on the road to Damascus. We will focus on two movements in the text to draw our attention to our task as a community called out by God to demonstrate his love to the world, especially within our own communities, by applying the lessons from this unique "love" story.